Engine Four stroke, transverse four cylinder, DOHC, 4 valve per cylinder. Induction 4x 38mm Keihin carbs. Front Suspension Telescopic air assisted and ant-dive. I couldn't believe the man at the Dyno. He had just told me that our Triumph Trophy had only recorded 108bhp at the back wheel. Surely not the same machine that I had ridden that very morning at over 145mph with the engine still pulling hard; the same bike that given a handful of throttle at 5000 revs will pull so forcefully you struggle to hang on as it gains momentum. We were both scratching our heads when the dynamometer began to cough, splutter and spew out another reading, this time the Trophy's torque - a massive 83ftlb at 3000rpm - gulp, more than a Kawasaki ZZR1100 produces at 8500 revs, suddenly it all started making sense. In my haste to see what power the Triumph was putting out I had forgotten the golden rule that brute horsepower doesn't make a vehicle feel fast - torque does. It's obvious really if you think about it, that's why drag racers all use big vee eights which produce monumental amounts of torque right where you need it most -low down. Track racers always talk about extracting the maximum amount of horsepower but that's because on a race track it's possible to keep an engine spinning at high revs where the motor is putting out its maximum power. On the road usually the opposite is true. Lines of traffic, slow moving vehicles and other inconveniences such as speed limits mean that you either have to be very brave or very foolish to utilise maximum horsepower. Not so, maximum torque which you can use every time you overtake another vehicle. The biggest difference between these two bikes is that everywhere you look the Triumph Trophy has torque in abundance, masses of it, huge great gobs of unstoppable, irresistible torque . The Honda CBR1000F doesn't. That's not to say the CBR1000F is not a great bike. As a sports tourer it has a lot going for it; for a start there's that 1000cc engine capable of transporting two people and their luggage at highly illegal speeds, a tank that gives a range of about 200 miles and a seat that you wouldn't object to using for the duration but, and here's the BIG but, it doesn't produce torque like the big Hinckley bike, it's not even in the same league. Riding the two of these machines back to back around some of Wiltshire's glorious roads it's possible to outline their strengths and weaknesses and assess the thought that went into each machine's particular design. For Triumph the story goes back to 1991 when the Leicestershire factory began producing a range of bikes using the modular concept -that is to say bolting together a range of interchangeable components on a (more or less) standard chassis with variations in cycle parts, styling and ergonomics to differentiate between the models. The Trophy sits at the top of this range utilising the largest engine Triumph make (a 1200cc across the frame four) allied to ostensibly touring components wrapped around the universal steel spine frame. What this means is that the Trophy feels much like all the other Triumph's in the range, that is tall and heavy but enormously fun to ride. The big engine design and frame that goes over, rather than around the motor, contributes to the bike's high centre of gravity ensuring that a fair effort is needed to swing the Trophy from upright to hard over and back up again; far more than piloting the CBR around a series of twisty bends. You always feel as if you're leant over further than you really are when you ride the Triumph, but the conservative steering geometry and grip from its Dunlop Sport radials means the bike oozes confidence and more importantly feedback. It may be big but the Trophy doesn't feel its size once you get out of town, and start chucking the thing around. In response to customer feedback Triumph changed the Trophy's riding position at the end of '92 pulling the bars back a touch and raising them slightly at the same time as lowering the footpegs. For this year no changes have been deemed necessary (apart from a switch to a 17 inch rear tyre from last year's 18 inch one) and the riding position is still extremely comfortable with one of the best seats to be found anywhere on a bike. You do feel rather upright but the fairing does a pretty good job at keeping most of the windblast away from you certainly at legal speeds. If you want to go a bit faster a semi-crouch (more of a slump really) will give you all the protection you need. It's still a long stretch to the bars though, where in front of you sits a straightforward set of instruments tastefully appointed with Triumph logos lest you forget upon which company's product you happen to be seated. Tacho and speedo are bisected by a temperature gauge with the usual array of warning lights thrown in for good measure. For some reason the digital clock didn't make it into this first group of instruments and appears something of an afterthought nestling in the fairing below your throttle hand. The ZX10 mirrors are still there and still work extremely well thank you very much. In fact there's not much to complain about at all with the Trophy's cockpit design, except to say that it needs to allow a bit more steering lock to improve low speed manoeuvring, and a fuel gauge would be nice. Looking at the bike from other angles it's fair to say that the styling has stood the test of time rather well. At its launch there was nothing progressive about the way the Trophy looked, it appeared dated almost from day one, well somehow today it seems less dated - timeless even. It's not a pretty bike but it doesn't offend the eye either - or perhaps I'm just getting old. Resplendent in its deep Caspian Blue livery the Triumph looks every inch a quality machine, the mouldings are well finished, the paint is thicker than a shed full of navvies .and the whole bike feels well screwed together. If I was BMW right now I'd certainly be worried. Honda too have got a reputation for making quality bikes. 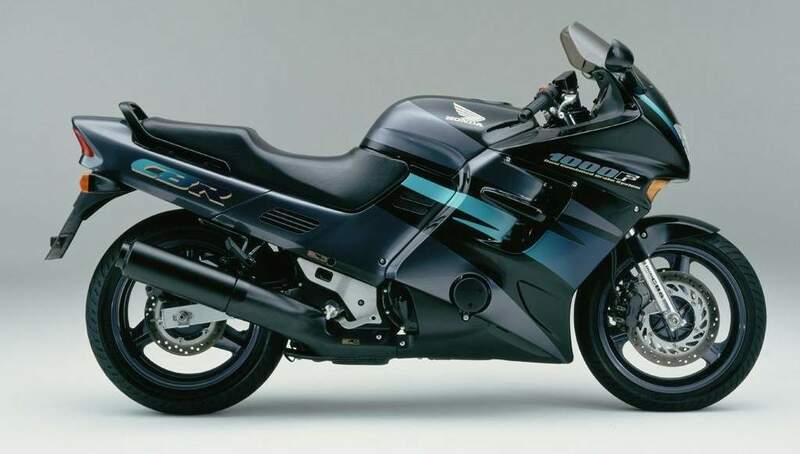 They're generally accepted as having the highest standards of the Japanese manufacturers and the last time we tested a Honda and a Triumph back to back (VFR v Sprint April 94), the Honda came out on top. The CBR is certainly no exception, it too has well fitting components, a comprehensive array of dials (including a fuel gauge), and quality paintwork. What lets it down however is its gaudy livery and unsuitable use of plastics for a bike costing nearly eight grand. Some six years after it was launched Honda still haven't got the CBR's looks right. It's better than it was but it still appears rather awkWard from some angles, with its front heavy bias and Starship Enterprise looks. Climb aboard and you are greeted by a grey plastic fascia that looks like something off an Austin Maestro circa 1982. The instruments too seem rather tacky, Trekkies would probably love them but to me they just looked too... well plasticcy "I suppose. And then there's that slogan adorning the headstock: CBR - LIQUID COOLED IN LINE FOUR... pur-leease surely the Mighty Honda Corporation could think up something more exiting than that to sum up their top of the range sports tourer? If I didn't know better I would probably declare it a mobile ecological disaster area. Wherever you look there are acres of plastic covering parts of a motorcycle that simply look better uncovered. Just to dyno it we needed to remove two of the plastic side panels, God knows what it must be like to contemplate routine maintenance on such a bike. At least there are benefits to be gained from all that fully encasing bodywork. First of all the CBR is uncannily quiet At any speed above tickover the only noise you can hear is the wind whistling past your earoles; with its rather linear power delivery and extremely supple suspension that floats and wallows over road irregularities, the CBR1000 feels as close as you will probably ever come to riding an electric motorcycle in the twentieth century. And come to think of it cleaning the Honda is a doddle, just hose it down, no nasty engine cases to polish or nooks and crannies to catch the dirt. Performance wise the CBR has plenty to offer if not inspire the spirited rider. The across the frame four pulls heartily from three grand, progressively building power all the way up to the 1 0,500rpm redline or 160mph to you sir. On the road you're never stuck for a bit of overtaking speed although you need to stir the gearbox around if you want to really stay on top of the power. Fast the CBR may be but it lacks the outright oomph of the Trumpet. At 3000 revs it is making just 45ftlbs of torque compared to the Triumph's 83ftlb. In fact from 2500rpm to 7000 the Triumph stomps all over the Honda in both power and torque. It's not until you reach about 7500rpm that the CBR begins to fight back, whereupon the Trumpet owner will simply cog up a gear and do it all over again. Depending upon who rode it, the CBR had either a wonderfully compliant and supple ride or felt like a quick grapple with Mr Blobby. I thought the suspension a tad soft for a 160mph motorcycle so I upped the preload and increased the rebound at the rear (the front is unadjustable), to see if that would improve things a little. It did but not enough to stop the wheels feeling somehow remote. The problem was the lack of feedback from the squidgy front end, coupled with rather uninspiring Dun-lop radials (different to those fitted to the Triumph) and a rangy wheelbase of 1500mm (10mm longer than the Trophy's), having the effect of leaving you wondering just exactly what was going on underneath you. If you can live without knowing what's happening beneath you the CBR will impress with its superb ride quality. As a supersports-tourer it makes a marvellous mile eater. On well surfaced open A-roads the compliant suspension and silent power-train waft you along as if aboard a magic carpet. Once the engine's spinning above five grand there really is plenty of muscle to hurry you along should the desire take you, and the bike feels best loping along in fifth or sixth gear using the engine's rorty midrange. Protection from the fairing is good enough at speeds below the ton, provided that you crouch down a bit to stop your head from bobbling around in the slipstream. As much as anything else it's the riding position that sets these two apart. The Honda is the more sporty of the two with lower bars and higher foot-pegs, forcing you to bend your knees more and lean further forward. The Trophy on the other hand has the more regal riding position. There's nothing much in it on the comfort stakes although the Triumph's rather over-damped 43mm forks make for a bumpier ride than the pillow soft 41mm items fitted to the Honda. At the rear I couldn't fault the Triumph, the shock was well damped and comfortable yet providing a level of feedback not found on the CBR. With both machines weighing in at more than 550lbs fuelled up it's no surprise that stopping either of them from speed requires something of an effort. The CBR's brakes are probably the better of the two although they lack the feel of the Trophy's four-piston Nissins. The Honda comes equipped with a linked brake setup, the right hand lever operating the two outer pistons on the front and rear calipers while the rear brake operates the centre piston in each of the three calipers. It takes a little while to get used to the feel of this setup as the bike tends to dive a lot less than you first expect. The Trophy on the other hand comes with the more traditional type of brakes which require a good firm tug to bring your speed under control. I found I needed to use the rear brake a lot more riding the Trophy just to give the front brakes a helping hand. The more I rode both bikes the more I came to terms with the differing feel both machines offered. The Triumph is more brutish in its power delivery, it seemed to me to be the two-wheeled equivalent of a Bristol motor car. Big, heavy, enormously powerful and quintessentially British. Lovingly crafted from quality components with no heed paid to lightness or to some extent cosmetics. It is over-engineered in the truest sense of the phrase and feels like it's built to last. Fast riding on the Trophy takes more effort but the payback is that it's a much more rewarding experience with positive feedback from both ends of the bike. 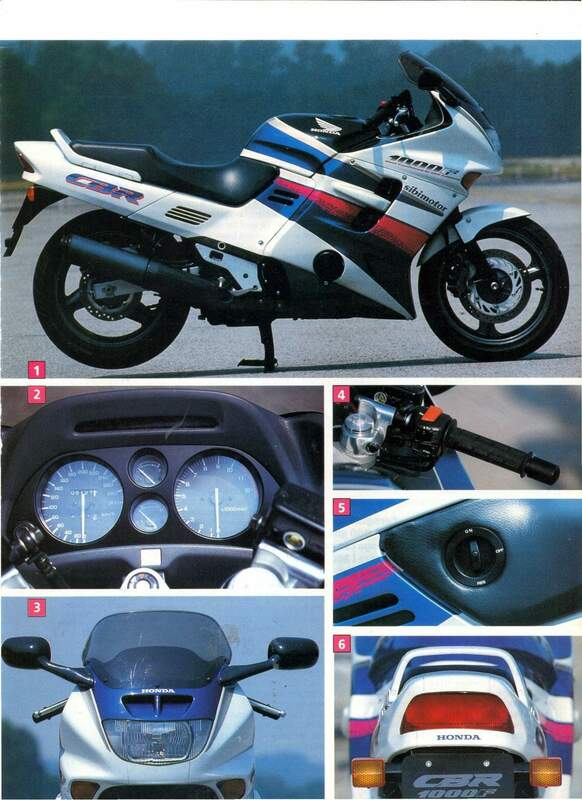 The CBR on the other hand is rather more refined in its power delivery. It flatters to deceive, cosseting you in such a way that you have to keep glancing at the speedo to believe how fast you are actually going. It too is well constructed, the panels fit together well, the finish is high and Honda's have a reputation for weathering the ravages of a British winter better than most. Gaudy graphics do little for the Honda however and ruin what is otherwise a rather competent package. If price is your deciding factor the Honda comes out the better of the two with a tag just the right side of eight grand. For that you get a genuinely fast touring motorcycle that's easy to live with and offers a truly outstanding ride. The Triumph owner on the other hand will find himself (or herself) shelling out ten per cent more for the privilege of ownership. To a certain extent this can be justified by the extra capacity, on the other hand you have to ask yourself is there a need for a bike that displaces more than one litre? In this case the answer has to be in the affirmative. One ride of the Trophy will be enough to convince you. The engine is a gem; from four to eight thousand rpm it makes power like you wouldn't believe and when allied to the well thought out and comfortable (if rather heavy) chassis makes for a motorcycle in the best grand tourer tradition. For a bike to feel so much better than a Honda with their massive resources at their disposal and an R&D budget running into seven figures is an achievement. For that bike to be British as well makes you feel extremely proud. It's good to know that Britain is capable (when it wants to be) of turning out a winner, and that jingoism is alive and well and living in Acton Towers.